14.01.2019. 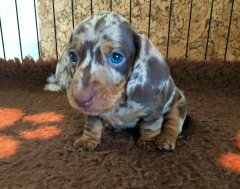 Dachshund puppies were born. FCI-CLASSIFICATION : Group 4 Dachshunds. BRIEF HISTORICAL SUMMARY : The Dachshund, also called Dackel or Teckel, has been known since the Middle Ages. From the « Bracken », dogs were constantly bred which were specially suitable for hunting below ground. From these short legged dogs, the Dachshund evolved and was recognised as one of the most versatile and useful breeds of hunting dogs. He also has excellent achievements above ground, hunting while giving tongue, searching and tracking wounded game. The oldest Club devoted to the breeding of Dachshunds is the « Deutsche Teckelklub » e.V., founded in 1888. 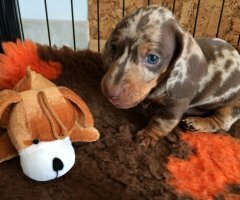 For decades the Dachshund has been bred in three sizes (Teckel, Miniature Teckel and Rabbit Teckel) and in three different kinds of coat (Smooth-haired, Wire-haired and Long-haired).